It’s been a very cloudy and wet period across the area — and we have two more storms to come over the next five days. Our next rain-maker comes Friday with relatively mild conditions throughout New England, but a storm that arrives Tuesday could bring some significant snow to ski country. Before I get to the snow, let’s talk about the rainstorm coming up Friday and how it may affect the weekend. A storm developing across the Great Lakes will move up into Canada as a secondary area of weak or low pressure forms along the New England coastline Friday evening, bringing a period of heavy rain for Friday night. This rain will be accompanied by the chance for a thunderstorm and some strong, gusty winds. This weather system is moving rather quickly, so by the time we get to Saturday morning, it looks like we will have clearing skies. This will set up the first dry daylight weekend we’ve had since September. In spite of the sunshine developing Saturday, remember that if you are planning on cleaning up leaves, it will be wet underfoot, and fields will still be wet Saturday morning. The weather then turns cool for Sunday and Monday with cold Canadian air in place. This sets the stage for perhaps significant snow for parts of the region Tuesday. On that day, another low-pressure area will move northward from the southern states loaded with moisture. Because this storm will be tracking through New England, there will be a warm and a cold side close by. On the colder side, most likely in the mountains and far western New England, at least some snow is likely. If the storm tracks further east and the cold air stays locked in place, then some northern areas could see more than 6 inches of snow. I would not be surprised if some of the higher terrain of southern New England sees a period of snow at the onset of the storm, but accumulation is unlikely. 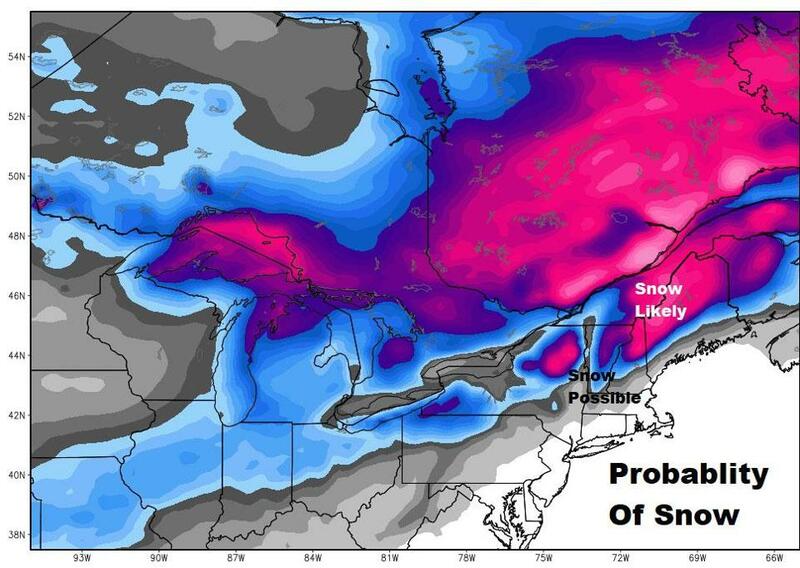 Snow is likely early next week across a wide area of southern Canada and into the northern part of New England. As the storm moves north and into Canada, it’s going to pull down the coldest air of the season so far. I suspect that many areas will see temperatures in the 20s behind this storm. High temperatures a week from now will remain in the 30s to low 40s for a couple of days. It looks like there will be a break in the consistently wet pattern we’ve seen, and we may finally get a chance to dry out and clean up before winter really sets in.